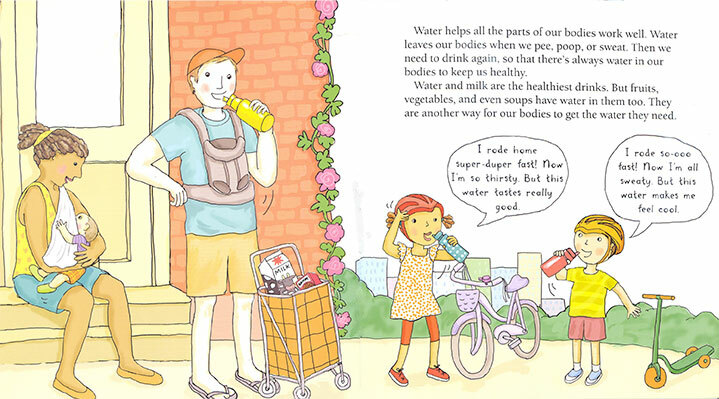 As a grandparent, I have witnessed first-hand that day-in, day-out, food and exercise are a major part of every young child’s and every family’s life. Once I began the research for WHAT’S SO YUMMY? (and that included talking with my grandchildren) and started talking and meeting with parents and chefs and other professionals in the fields of nutrition, education, child development, and pediatrics, I became fascinated with the topics that are now in this book—topics that include why too much sugar is not good for our bodies and the kinds of foods that are good for our bodies. 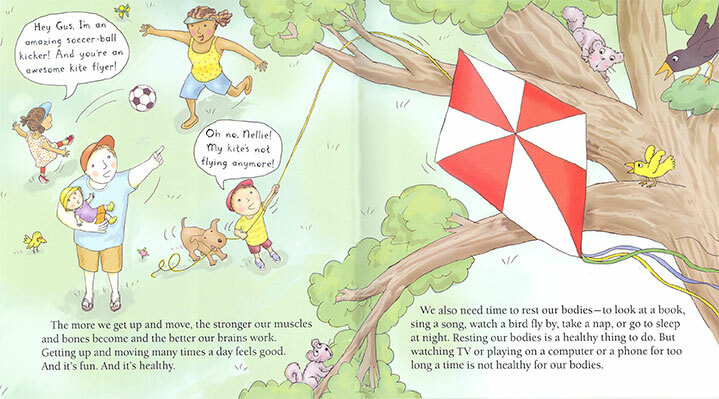 And that too much screen time is bad for our bodies, but going outside and exercising is good for our bodies. As a result, underneath this seemingly simple story is the latest available scientific and medical information on healthy eating and exercise. 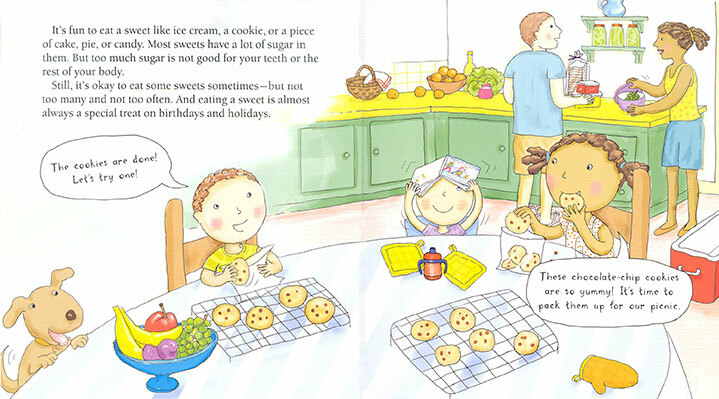 The straight-forward text and real-life conversations between siblings Gus and Nellie paired with warm and accessible illustrations by Nadine Bernard Westcott were created to help young children feel and understand that eating well can be not only be yummy, but can also be good for our bodies. And that moving more can also help all of us stay healthy. 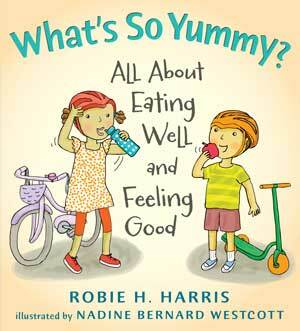 Harris, Robie H. What’s So Yummy? : All About Eating Well and Feeling Good. illus. by Nadine Bernard Westcott. 32p. Candlewick. Sept. 2014. Tr $15.99. ISBN 9780763636326. LC 2013955674. 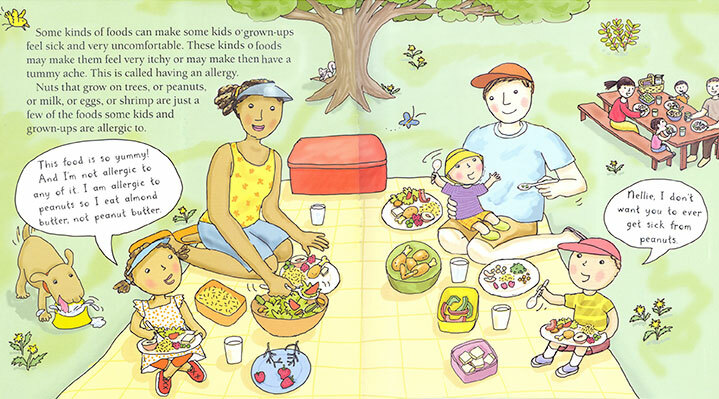 K-Gr 2–While the digital illustrations tell the story of a racially mixed family’s active day (walking and cycling to the community garden, farmer’s market, and grocery store before making lunch and preparing food for an afternoon picnic), text and speech bubbles from siblings Gus and Nellie provide the information about healthy foods and how they affect our bodies. Joined in all of the public settings with a multicultural background cast, smiles abound within and around the family unit, equating the act of making good food choices with family togetherness and fun. 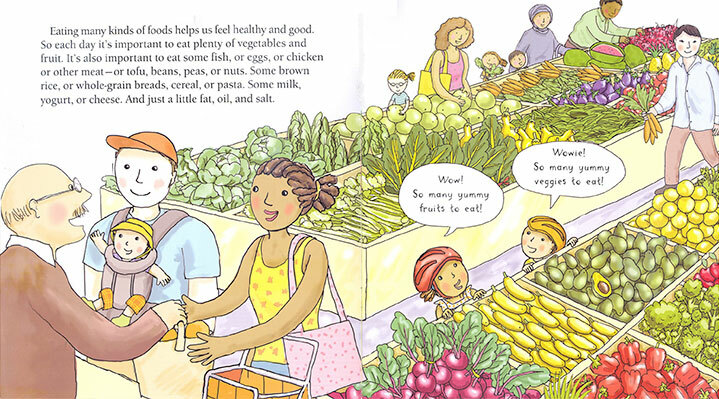 This genial positivism, along with the wide variety of featured foods (smartly labeled to provide new things to point out during repeat readings) makes for a fine resource for promoting a healthy lifestyle. —Joanna K. Fabicon, Los Angeles Public Library for School Library Journal. 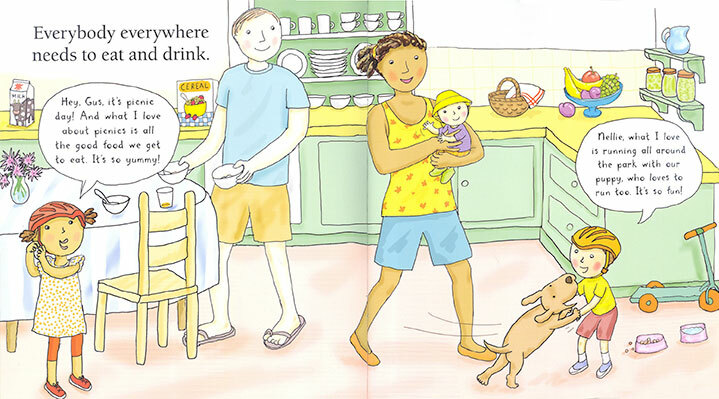 The sound text makes clear that not every family or person eats the same kind of food, and it even ventures into the issue of food allergies. Including a wide variety of people in the backgrounds, Westcott’s digital line-and-wash illustrations are clearly delineated, cheerful, and appealing. 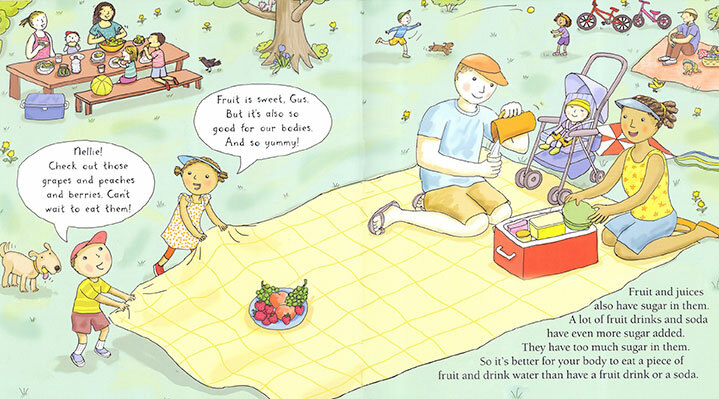 … [T]his picture book will be a useful addition to school and public library collections.